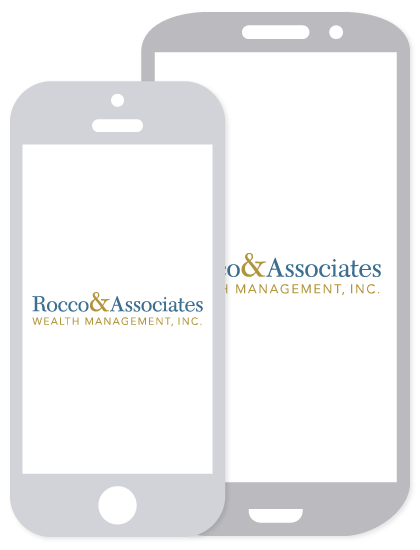 Market Outlook - July 2015 | Rocco & Associates Wealth Management, Inc.
With the second quarter coming to an end, looking ahead we are following several key market and economic trends. As of this writing, the S&P 500 Index has only risen 0.8% YTD. Investors are cautiously waiting on the side lines as the Federal Reserve, “The Fed”, prepares for a potential rate hike in September. With this news comes much market volatility. As stated in last month’s June Market Outlook, the summer months traditionally see a large decrease in market volume, which further adds to the market’s volatility. In June we have seen a 2.02% change between the S&P 500 highs and low points. This may not seem like much, but when the S&P 500 is only up by 0.8% YTD we must take into consideration the possibility of small market swings that are being exaggerated by this lower volume. Money managers and the other financial institutions responsible for managing portfolios for individuals and other investors, are also taking action to deal with this added volatility. In fact, fund managers globally hold more cash now than they have had at any other time during the past six months, according to a survey released Tuesday by Bank of America Merrill Lynch. In Europe, fund managers are holding more than they have since the depths of the financial crisis in March of 2009. Money managers agree that global markets have experienced major swings over the last month. 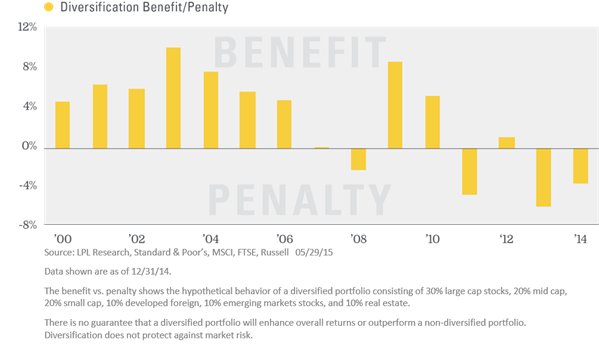 Therefore some managers are retreating to safety by allocating a higher portfolio position to cash. With this cloud of uncertainty over the markets we are encouraging patience. All of our investment strategies are tailored for the long run, and have allocations that seek to perform during periods of slower market growth. Diversified portfolios with holdings in multiple sectors have outperformed undiversified portfolios for 10 out of the last 15 years (see chart below). Not only do we recommend diversification to our clients but also invest monies systematically over a set period of time. With the current market conditions, this means that we are allocating client portfolios by taking advantage of lower market prices during these volatile times. Finally, we have always been proponents of active management. We want our clients to know that their investments are not just laying idle in an account tracking an index such as the S&P 500. We believe that by combining these three factors; patience, diversification and active management, our clients may be in a better position to comfortably weather the markets ups and downs over time. In other market news, The Fed has stated that they believe the dip in first quarter GDP was transitory and that the U.S. economy will strengthen enough to sustain one, if not two, interest rate hikes this year. With this being said, markets have historically decreased in the months leading up to a rate hike, but rally in the months following (see graph below). 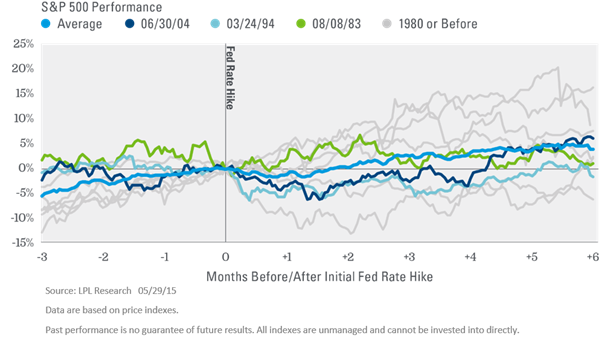 LPL Financial stated the following from their Mid-Year Outlook published in June 2015; “…some volatility around the first Fed rate hike in an economic cycle is normal.” This chart shows the performance of the S&P 500 around the initial rate hikes after the end of each recession since the end of WWII, highlighting the recent dates (1983, 1994, and 2004) and the average. The S&P 500 moved higher 5 out of 9 times, 3 months after an initial rate hike, but performance improved over time. The S&P 500 increased 7 out of 9 times over the following 6 months after a first Fed rate hike with an average gain of 4.2%. We expect the pace of Fed rate hikes to be gradual; therefore, we do not see the potential start of interest rate hikes as a big risk to the stock market over the balance of the year and into the longer term. We are continuing to follow any developments from the Middle East and Greece. Debt talks between Greece and EU creditors have continued for the last five months without any resolution. News out of Athens this week is indicating that Greece is close to agreeing to a deal with creditors, but unfortunately we have heard this before. As for the Middle East, we see it as a region of turmoil that should be watched, but should not affect the U.S. economy in the long run. There will always be some unrest in the world, but at the end of the day, the markets have historically outperformed even throughout uncertain times. Overall we are still very positive on the U.S. economy. There have been many questions raised from Wall Street investors relating to the Fed’s interest rate decisions and global economic volatility, but we believe that here at Rocco & Associates Wealth Management our client’s portfolios are prudently allocated according to their risk tolerance. The market value of corporate bonds will fluctuate, and if the bond is sold prior to maturity, the investor's yield may differ from the advertised yield. The economic forecasts set forth in the presentation may not develop as predicted and there can be no guarantee that strategies promoted will be successful. No strategy assures success or protects against loss. The prices of small and mid-cap stocks are generally more volatile than large cap stocks. International and emerging market investing involves special risks such as currency fluctuation and political instability and may not be suitable for all investors. Investing in Real Estate Investment Trusts (REITs) involves special risks such as potential illiquidity and may not be suitable for all investors. There is no assurance that the investment objectives of this program will be attained.